However—and this is a big however—food and other rewards can be misused and certain actions on your part may actually make your dog less interested in training. Here are five do’s and don’ts to remember when training with food. 1. Don’t use food as a lure any longer than you need to. It’s OK to use food in front of your dog’s nose to help get a certain behavior quickly (this is called a lure). But if you use the lure too long, your dog may not do the behavior unless the food is front and center (and none of us wants that!). Do switch to a click or “yes” and reward as quickly as possible—usually within the first few repetitions. Once you are marking the response you want with a click or “yes,” and your dog is now getting the food as the reward rather than the prompt, the learning curve will speed up dramatically. 2. Don’t be stingy by only giving one tiny, itty-bitty boring treat when your dog’s behavior warrants a steak. Remember that the goal of the reward is to increase the likelihood that the behavior will happen again in the future! Is dry kibble enough of a reward to make your dog want to come to you the next time he sees a squirrel? Do let your dog know when you appreciate his great responses—generous food rewards coupled with verbal appreciation will make him more likely to provide a great response again in the future. 3. Don’t tease your dog by showing him the food and then not giving it to him. This is the quickest way to de-motivate your dog and to cause a training shutdown. Showing the food is tantamount to saying, “If you do X, you will get this treat.” If you don’t give it to your dog, you are breaking that promise and diminishing trust. Do always give your dog the reward you promise. 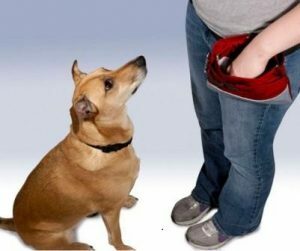 Always give the food to your dog when you lure, if you show your dog the treat, and when you click or “yes.” When you keep your promises, your dog’s motivation and trust will grow. 4. Don’t abruptly stop using food as reinforcement. This is a sure way to extinguish a behavior. Your dog will likely stop doing the behavior when you ask. Do very gradually shift how and when you reward your dog. For example, after your dog understands the basics of a behavior, you might start rewarding the best 4 out of 5 responses to help encourage your dog to progress. You might also sometimes ask for more than one behavior for a single treat (after your dog really knows the behaviors). But shift rewards carefully. If your dog becomes less enthusiastic about doing the behavior, you may be asking for too much, too fast. 5. Don’t only use food for reinforcement. While food is one of the strongest and easiest to use reinforcements, your dog likely finds other things in his life rewarding too. If you only use food, you are missing out on the power of varying reinforcement. Do learn what other things your dog finds rewarding (and in what circumstances and environments). Games, toys, play with pals, running free, getting to sniff, loving and praise are just some ideas.